Senators Mark Udall and Michael Bennet introduced the San Juan Wilderness Act of 2011 to the 112th Congress. If passed, the law will add approximately 33,200 acres of wilderness land to the existing Mt. Sneffels and the Lizard Head Wilderness areas of southwestern Colorado. In addition to the wilderness lands, 21,620 acres of federal land will receive special protection in the San Juan Mountains near Silverton, Colorado. The special protection bans the use of motorized vehicles and the construction of roads, but fails to protect the streams and rivers from future water resource projects. The San Juan Wilderness act contains provisions for the creation of one new wilderness area and the enlargement of the Mt. Sneffels and Lizard Head Wilderness areas. 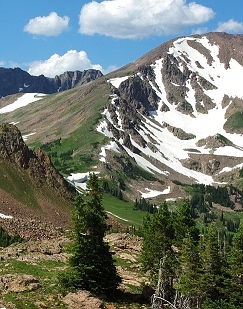 McKenna Peak Wilderness – 8,600 acres of BLM land southwest of Telluride. Whitehouse Addition – 13,000 acres added to the Mt. Sneffels Wilderness near Ouray.